Considering the person who made the original article left goofans, I decided to make another topic. This is so all the important links can be put at the top for all to see. Without further ado, here they are! This should be everything. If there is something that I should add to the list, tell me. Anyway, let's get goo-ing! Sorry I didn't get back to you quickly enough. I had no notification whatsoever. Anyway, your level seems pretty good. My only concern is that the detaching gears to the left are a little pointless if the wind blows you to the right. Speaking of that, the gears would be better of as spikes, and the wind should be a little weaker. Also, shouldn't it be winter themed? I was thinking there can be like a valley with water at the bottom at some point. Not sure. I'll see if I can get a solid chap 1 concept up, with just a rough sketch. I just wanted to point out something about the Rainbow Goo. It's literally impossible to have 6 strands on a goo ball. The max is four, no matter what you put in the strands value. But, it could be detachable. It wouldn't be a bad idea. EDIT: Thanks for the new post, too! Well, if you're trying to say that it's impossible to have six strands when you attach it to a structure, I guess you're right. I guess they could be detachable, but I feel if they weren't, it'd be better. EDIT: Now that I think of it, could the first chapter be in early spring? That way, there can be both snowy and regular levels. (the snowy levels would take place at higher altitudes, and may be somewhat harder. Sounds great! I think it will allow us to mix both themes much better. So then, how many levels are going to be snowy and how many aren't then? How does this look for the island map? 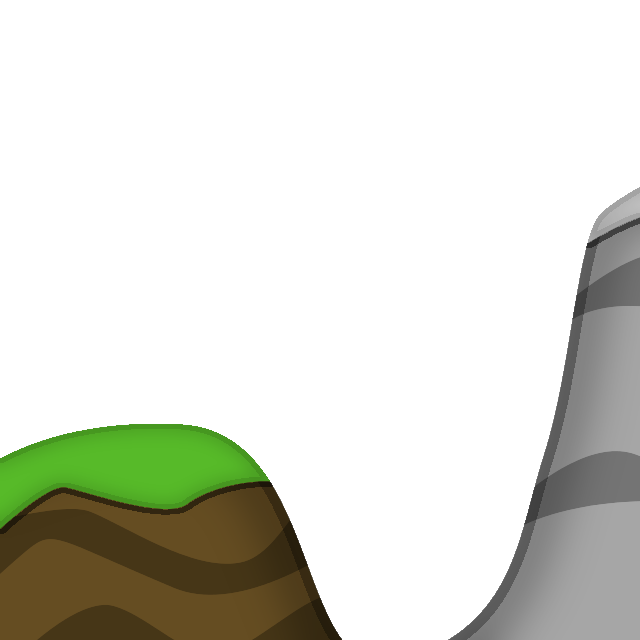 I like how there's two different sections, but I envisioned it more to be brown dirt-coloured mountains with snowy regions near the top. If I know more Bionicle lore, I could've written a better synopsis, but oh well. For now, though, It'd be better off to make sure the first part gets finished in the first place. ...I've been gone for quite a while. EDIT: Sorry I've been gone for a while, with school getting in the way, (and also being sidetracked by other things) It was a little hard to anything, and even look at the forum page! Well, since I'm back I'll go ahead and get some level ideas out there! Is this anyone still working, as a matter of fact? I keep getting side tracked, so I just look at new posts. I might make some art if I'm suggested to do so, though. Cool! Do you have a link, because it'd be nice to use in a level. If you can convince other people to use it, then I'd use it as well. Otherwise, I don't necessarily trust the program (it's a bit foreign to me). Discord would probably be the easiest to organize, as you can make discord chat rooms/servers. I can look into setting up a Discord server of sorts for this project. Also, sorry for my inactivity, I've been busy(again,) and I haven't really had any ideas spark. If anyone needs art for some sort of level idea, let me know. Not only do those links seem irrelevant, but judging by the URL, pretty inappropriate for somebody such as yourself (unless you're a troll). @daxperrin, I highly doubt anyone would want to make levels with those images. Please do not post that kind of stuff here again, thanks! The images are inappropriate therefore will not be used no matter how hard you try to convince us. As for the music, is it royalty free (or free to use with permission or whatnot)?